As you must have noticed by now, Nepali people have lots of celebrations and functions. When a baby is born there are many celebrations as well. The first ceremony is called Nwaran (analogous to baptism ceremony). It is also known as Machabu Byakegu in Newari. It takes place on the 11th day. This ceremony is performed to give a birth name to a child according to his/her lunar horoscope, this is usually not the name by which he/she will be known. This ceremony is normally small and celebrated amongst close family. Then there is Pasni ceremony which is also known as rice feeding ceremony or Weaning Ceremony. This ceremony is also called Annaprashan which in Sanskrit term, literally means grain initiation. It is the first time the baby is fed solid food. It is called Macha Junko in Newari. Pasni is normally held after 6 months from birth for a baby is boy while if it is a baby girl, it is held after the fifth or seventh month. The day and time will be fixed after consulting a priest/astrologer. As I have attended a few Pasnis lately, I am sharing the photos and procedure of Pasni here. The ceremony begins at home. On the morning of Pasni, the baby will be showered and wrapped in a towel for the ceremony to begin. The Fufu (Babies dad’s sister) of the baby will hold the baby during this ceremony. Normally Fufu and other women in the family wear red sari. 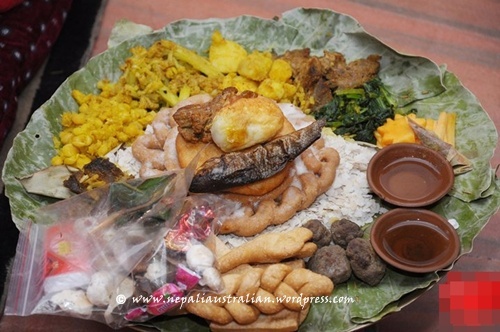 The place where the ceremony is to be held is cleaned and all the required ritual puja plate and food are arranged. Then the elder lady of the family will start the puja with the help of the priest. 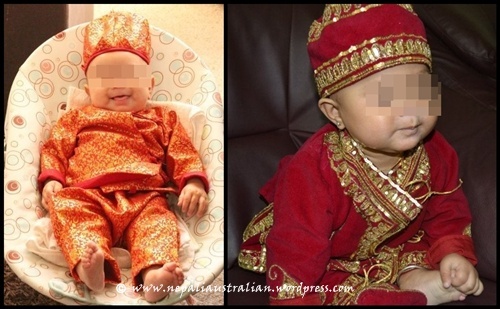 The first step is to put tika on the forehead of the baby, then the baby is given a special outfit, usually made of red velvet and embroidered with silver and golden threads. 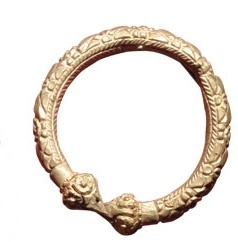 Gold and silver ornaments are also given to the baby, like heavy silver anklets (kalli) carved with dragon at both the ends to keep the bad omens away from the baby as well as gold bracelet. Once it is handed over, the baby is dressed in this special outfit and the ornaments and further ritual starts. First the baby is given dubo ko mala (a garland of holy grass). Then it is followed by puja and symbolic feeding of kheer (rice pudding) or the first bite of solid food. The baby is then offered all kinds of foods to taste from Thaa bu (a plate which has eggs, yogurt, wine, fruits, Roti, meat, fish) . Baby will be also offered a tray of stuffs like books symbolising learning, jewels symbolising wealth, a pen symbolising wisdom, clay symbolising property, food items symbolising a love for food (There can be anything symbolising a career. A friend of mine had stethoscope symbolising a doctor) and it is believed that depending on what the baby pickes, it will determine his/her future career. Family and friends have a great time cheering the little one while he makes his choice. There are lots of food and gifts given to the child from his/her mother’s family. It will also include Sagun. 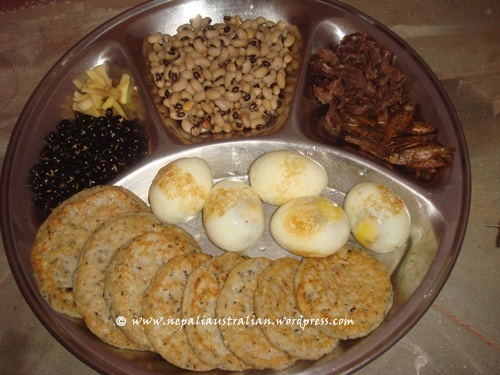 Sagun typically consists of a boiled egg, smoked fish, a bara (pan-fried black lentil patties), haku chhoila (smoked buffalo meat) and aila (wine) and ends with dhau (yogurt). 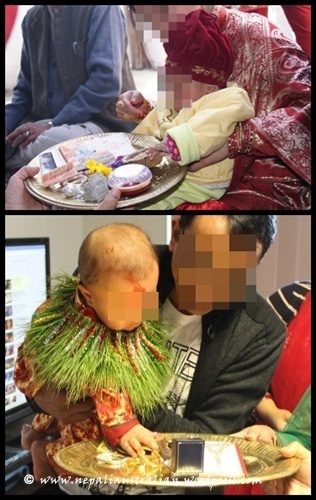 Also all the family and relatives bless the baby with gifts or money. It’s a beautiful and elaborate ritual. After that maternal uncle (mum’s brother) carries the baby to the nearest temple so the baby can get blessing from the gods. In front of the temple, the baby is fed with some Prasad (offerings) and this will conclude the ceremony. It is an occasion for celebration, and family and friends are invited to attend. These days Pasni ceremonies in Kathmandu are very lavish and are held in party function rooms much like a wedding ceremony. The guests, numbering in their hundreds bring gifts for the child and party late into the night. 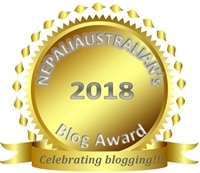 This entry was posted in Nepal, Nepali Culture and tagged Annaprashan, baptism ceremony, dubo ko mala, golden threads, junko, Macha Junko, machabu-byakegu, nepali kalli, Nwaran, Pasni, silver anklets (kalli), silver ornaments, Thaa Bu, Weaning Ceremony. Bookmark the permalink. Does any one know about a newly born baby dress ‘Mekhalo’ ? Sorry I don’t but hope someone here can help. Pingback: A Rite of Passage: the Nepali Story | Culture and Celebrations! Reblogged this on Rabin's Blog (.com). kudos to u. i couldnt stop myself to praise u for the work u’ve done, u r making the culture global and sharing ur travel experiences in a way that we readers feel that we are going with u on the tour as well. good work. Thank you so much Shilu. I am trying my best to bridge the gap. One day I wish to make my kids aware and love our traditions and cultures. I loved this post, but I’m a baby lover myself and love just about anything having to do with babies. I wish we had more sacred practices like rice feeding in the US. My daughter’s first food was rice, very very overcooked rice so that it was more like a soup than a grain. I waited until she was 6 months. I had no idea this was a practice in Nepal at the time and really smiled inside when I first learned about rice feedings. Nwaran (or Vidhisanskar – Fate goddess comes to write the fate of child) is actually the second Sanskar by us. First Sanskar after birth is same day or second day (depending upon Mahurat), the Jatakarman sanskar. According our ancient scriptures, there are three/four other sanskar (obsolete for most part now) that are performed before the birth. First one is Garbhadharan sanskar. Al the pre-birth ones are almost obsolete except the Srimant (baby shower). Nice recap though. I admire your efforts to highlight traditions & ceremonies from our culture. Is there any ceremony for before the baby is born…something similar to a “baby shower”? First cousins, if still no girls, second cousins. Some go with Dad or Mom’s sisters too (Aunts). The whole idea behind is to give importance to sisters (women). Back in the days it was hard for a girl to visit home from in-laws. Traditions like these made it convenient for them to attend family functions & spend time with loved ones.